This holiday card from Blizzard is guaranteed to have 100% more swarming insectoid aliens than any you'll find from Hallmark. I love this time of year. Sure, it's kind of cold - even down here in North Carolina - and you can't go anywhere without hearing the same 15 holiday songs over and over again, but it's kind of fun anyway. At work, we're past the huge Q4 release crunch so everything is a bit more relaxed, and the studios start sending out holiday cards. We get some cute cards every year - I still have a Square-Enix card with the Kingdom Hearts crew wearing Santa hats. One developer who always seems to get into the spirit of the season is Warcraft studio Blizzard, and we found their e-card in our inbox this morning. Let's be honest, the studios are probably hoping that we'll take the cards and share them all with you guys. Who are we to argue? 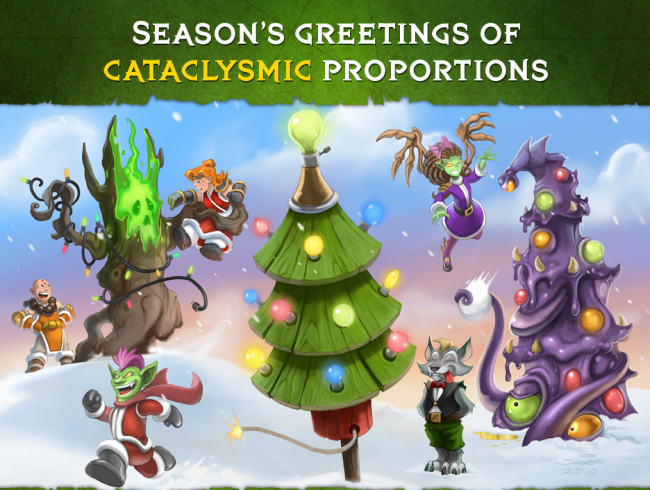 As with all of Blizzard's recent holiday images, the art is by the studio's art director Samwise Didier. In it, we have adorably youthful representatives from all three of the developer's pillar franchises - Kerrigan from StarCraft II, a Worgen and Goblin from WoW: Cataclysm, and a Barbarian and Monk from Diablo III - all with their own personalized holiday trees. I'm not sure what's going on over on the Diablo side of things, but the Monk looks hilarious. Meanwhile, the Worgen looks entirely too content for someone who's about to get kersploded. Anyway, it's all very endearing. Let this be a lesson, developers - it's easier to share our holiday cards with everybody if you send it along as an email attachment, too.